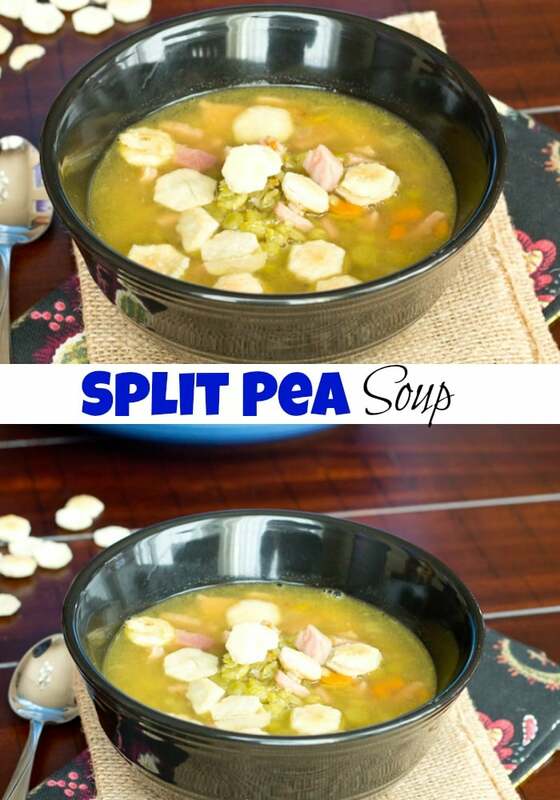 Split Pea Soup – Using leftover ham makes the best soup! 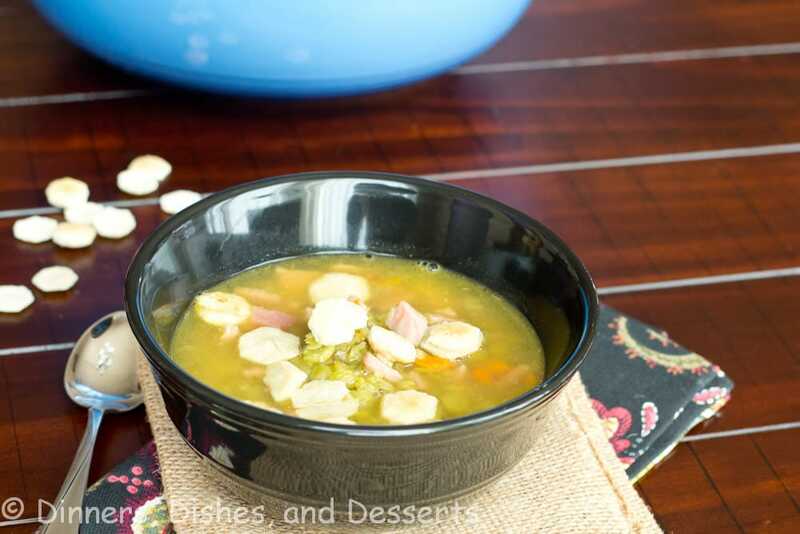 This split pea with ham soup is comforting, delicious and makes a great meal! I am a huge soup lover, espcially when it is cold outside. It is the best way to warm up on a cold night. Plus it is my excuse to have fresh bread. These Honey Butter Dinner Rolls are pretty much perfect with any soup. Soup can be a great use when you have leftovers too. 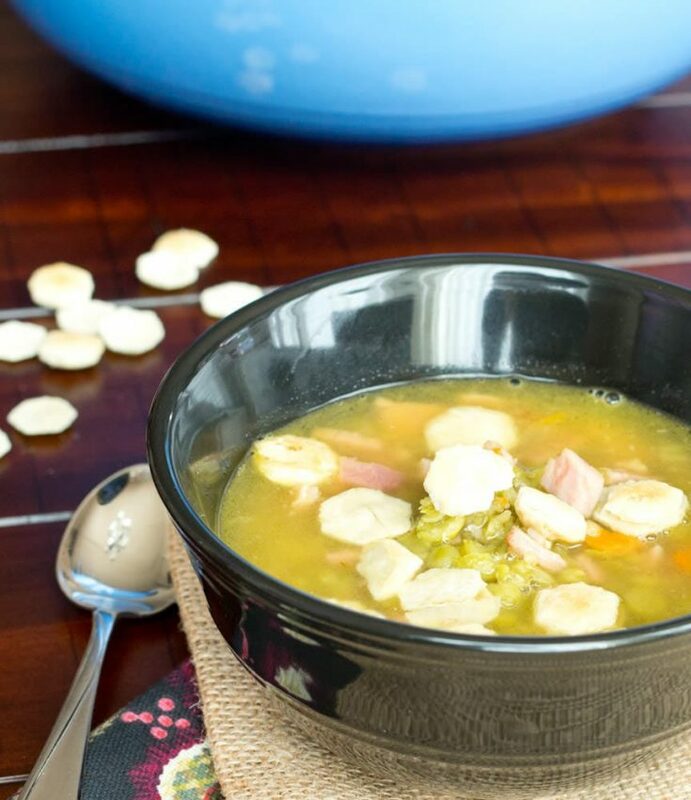 This Split Pea with Ham soup uses lots of leftover ham after your holiday meal. 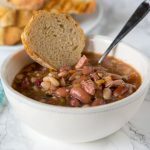 Ham & Bean Soup is another great one that you can use the ham and the ham bone in. This Split Pea Soup is one of my husband’s favorites. Peas are one of the few vegetables I don’t like, so I always forget about it. I need to remember to make it for him more often. It is really easy to make, and great to have on hand. The hardest part is probably soaking the split peas in water overnight so they soften. You do have to plan ahead, but otherwise so easy! Plus you can freeze and have it on hand for lunches or another dinner later. That is my kind of meal! 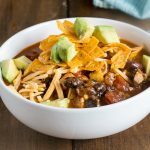 I currently have Taco Soup in the freezer, and I think I need to make more! Start with dried split peas. 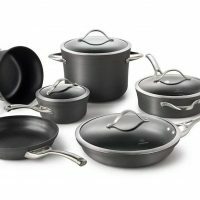 Soak in water overnight to let them soften and then you can start cooking with them. Use diced ham. You can use leftover ham or just buy the pre-diced ham from the store. Both work really well. Let everything simmer for about an hour. This brings all the seasonings together and makes the perfect soup. You could easily add everything to the crock pot and let it cook on low for a few hours as well. 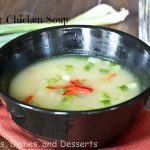 My husband prefers his soup brothy like this, but use a stick blender if you want a smoother, creamier version. 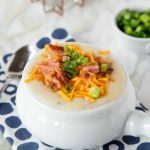 This split pea soup recipe is my go to when I have leftover ham. 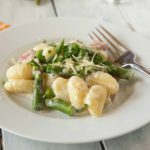 It does take awhile to simmer on the stove, but that is mostly hands-off, so it is super easy to make. 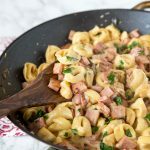 If you have the ham bone, you could let it simmer with the soup as well to give it even more flavor! As the peas cook and start to break down, they help thicken the soup and give it a nice creamy texture. The only way I have ever seen split peas sold is dried. So they will need to be soaked or simmered in liquid before they are used. 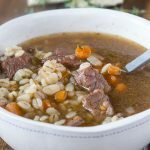 You can make this soup without soaking them first, your soup will just need to simmer for 1-2 hours longer until the peas are cooked. To soak your split peas just place them in a plastic container and cover them with about 2 inches of water. I place the container in the fridge and just let them sit there overnight. Then you are ready to use them in the soup the next day. Split Pea Soup - Using leftover ham makes the best soup! 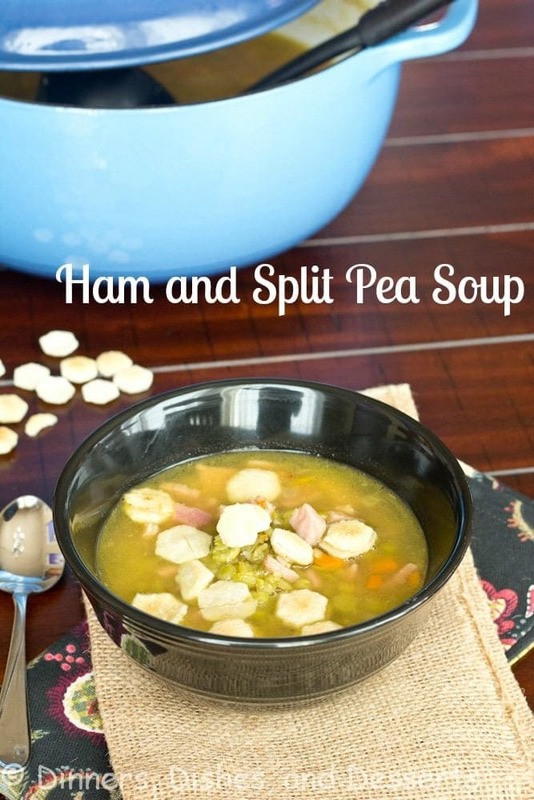 This split pea with ham soup is comforting, delicious and makes a great meal! Put the dried peas in a large bowl, cover with water by 2 inches. Let soak for 8 hours or overnight. Drain the peas, set aside. In a large stock pot melt the butter over a medium-high heat. Add the onions, and cook for about 2 minutes. Stir in the celery and carrots, cook until everything is getting soft, about 3 minutes. Add garlic, and cook for another minute. Stir in the chopped ham, and let it begin to brown. Add the drained peas, salt, pepper, and red pepper flakes, stir to get everything mixed together. Pour in chicken stock, and add the bay leaf. Let is simmer for about 1 hour, stirring occasionally, until the peas become tender. Add water as needed if the soup gets to thick. Remove the bay leaf, season with additional salt and pepper if needed, and serve. I don’t think light green food EVER looks amazing in photographs! Dark green, sure, but light green? Never! This is my step-father’s favorite kind of soup too! I should surprise him with a batch sometime. And by the way, I think you did a great job with the pics! 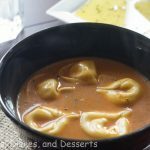 Skip the crackers for me, but the rest of the soup looks divine! 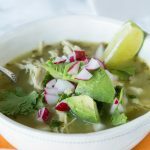 This has to be one of my most favorite soups. It is something that reminds me of being young. My mom used to always make it in the winter time right around Christmas because we had ham leftover. 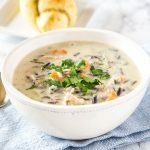 I love soup season, crackers are the perfect topping! Sounds quite yummy for a cold winter day to me Erin. I actually like the color of the soup! We are in one of Canada’s worst flu season right now. A cuppa soup like this tastes just like home and makes you feel warm and fuzzy – for all the right reasons! Split pea soup is my absolute favorite soup! even though split pea is not the most photogenic soup, you nailed it! it looks fantastic! I love soup and I haven’t had a split pea soup in forever. 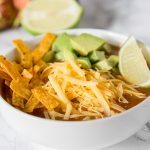 This looks so good and perfect for a cold day! Thank you, Erin! You read my mind. Split pea soup is my husband’s favorite also. I was thinking last night about how we could save money if I simply just made the soup. And, voilà, your post appears. And your recipe looks super-do-able. Yea! 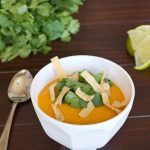 One of my favorite soups on earth! Perfect way to use leftover ham. Delish! LOL… green soup is hard to photograph, I agree. I had to fuss with my own split pea soup photos when I made it and thought it look like something that did not look edible.